Proprietor Alain Vauthier has made another virtually perfect wine in 2007. The divinely scented nose is wonderfully complex and expressive, with creamy wild blackberries to the fore. Immensely elegant and vibrant, the dark fruit rolls across the tongue in waves with lovely focused minerality and a straitjacket of acidity from which it will gently ease free as it matures. Made from 55% Cabernet Franc and 45% Merlot, from 50 year old vines, this wine is all about intensity and balance. With only 1500 cases made, the possession of this elixir will be a rare privilege indeed. The Wine Advocate - Tasted blind at Farr Vintners 2007 Bordeaux tasting. The 2007 Ausone has a high-toned bouquet, a little flashy in style compared to its peers with touches of salted licorice coming through with aeration. The palate is medium-bodied with supple tannins and fine acidity. This is more cohesive and mild-mannered than the feisty aromatics, with good depth and a caressing, quite plush finish. It is a fine Saint Emilion, though it does not quite possess the breeding of the Cheval Blanc 2007 that was tasted alongside. Tasted March 2015. Jancis - "55% Cabernet Franc, 45% Merlot. Heady. Rich and heady. A bit angular, not exaggerated but in this damp vintage not as mellifluous as Cheval's gravel-based wine. Some green notes, a little awkward. Not Ausone's finest hour, I feel. A bit chewy and green. We have to take the development on trust really, although I know the wine provoked greater enthusiasm a couple of days before." 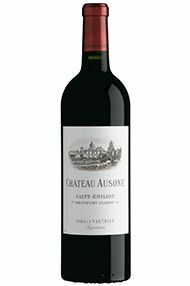 Parker - The 2007 Ausone is a candidate for one of the wines of the vintage, rivaling Pavie and Lafite Rothschild. Its deep ruby/purple hue is accompanied by a beautiful nose of spring flowers, raspberries, black currants, and crushed rocks. The wine is dense, medium to full-bodied, and pure with sweet tannin as well as a surprisingly evolved, forward style. It is one of the few Ausones I have tasted that can be drunk with great pleasure at this stage, yet it promises to evolve for two decades. Decanter - 50% Cabernet Franc in the blend. Really polished wine. Close to Ausone in style and stature. Has the depth and intensity many lack in 2007. Full and fresh with a fine tannic line. Chateau Ausone is named after the Roman poet Ausonius who owned over 100 acres of vineyard around Saint Emilion. 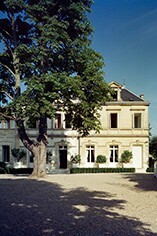 It is perched on the hillside in the southern outskirts of the village of Saint Emilion. Ausone has only 7.3 hectares of vines and its vineyards (Merlot 50%, Cabernet Franc 50%) flourish on a steep, south-east facing slope, protecting them from cold north winds and westerly rain. Those vines at the top of the slope thrive on limestone (the `St.Emilion plateau') whilst those further down benefit from a clay/loam topsoil (the 'Côtes'). Ausone struggled during the 1950s and 1960s, but with the hiring of new régisseur Pascal Delbeck in 1976, the estate returned to producing wines worthy of its outstanding historic reputation. Recently Ausone has been at the very peak of its form and with the ubiquitous Michel Rolland now acting as consultant, it is now producing ultra-rich, lush, exotically fruity wines that require a minimum 10 years of bottle ageing.